Designed to help you hold your phone very securely to therefore prevent drops. Helps prevent pinky deformation and therefore aching. In addition, conforms to your fingers. In other words, extremely comfortable! Grip can thus be used as a kickstand by bunching up bottom end of the grip and sticking to itself. An excellent aid for arthritis sufferers, stroke patients, as well as hand therapy patients. It can similarly help those living with multiple sclerosis, Parkinson’s Disease, carpal tunnel syndrome or other nerve-related injuries with activities of daily living. 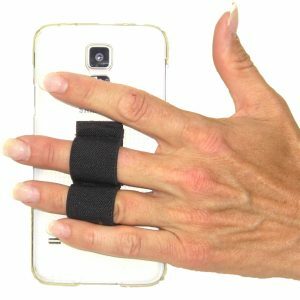 Wear your phone grip on the back of your hand like a ring. Suddenly you therefore have a free hand to grab your keys, beverage or other items. Applies to your mobile gear or its case with an easily removable hook-and-loop design. Small – fits children and those with very small hands and therefore very slender fingers.